A few years ago, when 127 hours came out, I remember chatting about the story line and debating what I would do in a similar situation. For the benefit of those who haven’t seen the film, or read the book, it is a true story of a young man who goes canyoneering in Utah and becomes trapped after a rock fall. The only way for him to escape was to cut off his arm. 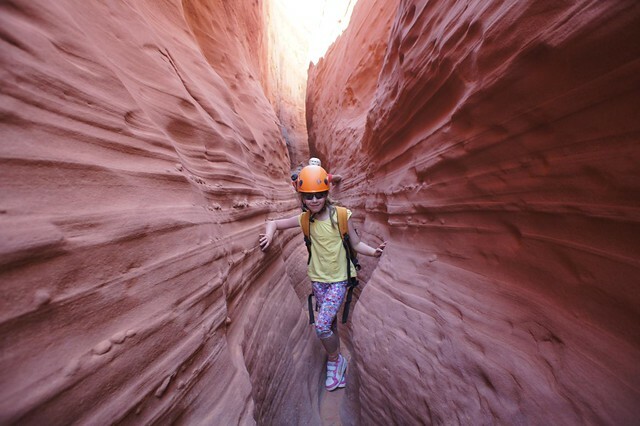 So when I was planning my trip for me and my seven year old daughter to Utah and someone suggested that I should try canyoneering, I thought they were joking. I was promised a day I would never forget and a truly amazing experience. Never one to like to turn down a challenge, I very nervously agreed to it. As the day approached, I was nervous both for myself and my daughter. Our trip would involve rappelling (abseiling) and then squeezing through narrow gaps, going deeper and deeper into the canyon. We were told to wear old clothes that we didn’t mind ruining and told to turn up for a briefing in the office before our guide would take us out into the Escalante Grand Staircase Monument. The town of Escalante itself is very small and not much to look at. To the east of the road, lies hundreds of miles of barely explored desert land. Dinosaur bones, Native American artefacts lie undiscovered and only very few venture off the main road into this barren area. The slot canyons themselves cannot be seen from the road and because of the risk of flash flooding in the area (this is how the canyons are formed in the first place) it is inadvisable to visit without a guide. We arrived at our briefing for a health assessment so that our guide could choose a suitable canyon for us. Despite my protestations that we should go for a very very easy option, Rick, our guide, made his selection, kitted us out and took us off in the car. As we were driving, he soon put us both at ease, pointing out sights of interest and stopping off to show us a very rare collared lizard that he had spotted along the way. Once we arrived, he talked us through what we were to do and then I rappelled down a 50ft sheer cliff. To say I was nervous is a bit of an understatement, but he talked me through what I needed to do and I found myself enjoying it. It was all water off a duck’s back for my daughter, who rappelled down the drop as if it was something she did on a daily basis. For the rest of the day, we progressed further through the slot canyon, going deeper underground until the canyon walls above us were 100m high. 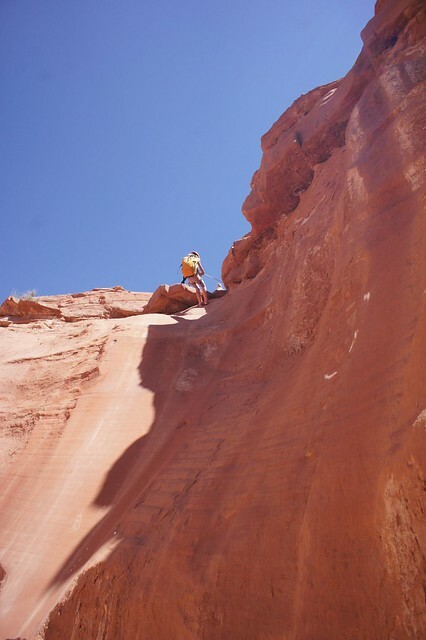 There were more drops to rappel and as the canyon became narrower, we had to squeeze and bridge our way through. Passing the odd lizard and a fledgling peregrine falcon learning to fly, we saw or heard no other humans for the entire day, which was very refreshing after the jostle of the national parks. Five hours later, we emerged from the canyon into the bright sun, thrilled with our achievement. My daughter was the youngest person ever to have been in the canyon and she loved the physical challenge, I was immensely proud of both of us. Slot canyoning isn’t for everyone – if you have a fear of enclosed spaces then you won’t enjoy it at all – but it is an absolutely fantastic way to get escape this very crowded and touristy corner of the world and experience the solitude and majesty of Mother Nature. Definitely one of my highlights of the area and highly recommended for families wanting an exhilarating and fun day.